These are unpolished Agate or Jasper slabs and rough, with dendrites (tree-like patterns) in them. We charge one shipping cost for all that will safely fit in a Small Priority Flat Rate box and will ship to the U.S. as well as Internationally. First Class shipping available on request. See our Store Policies for full details. Please check back - while we may still have some, no more are photographed at this time. 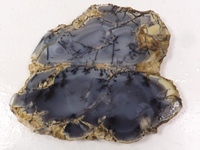 This is a piece of Dendritic Agate. Not sure where it was collected, just one in a number of old stock slabs we acquired at one point. Some pretty little dendrite patterns in it. One photo in the slideshow shows it with light from behind. It measures 4 3/4ŗ x 2 1/4" at the widest points, and weighs 3.2 ounces, or 91.2 grams. It is mostly a little over 5 mm thick except on one end it up to 14.5 mm. This is a pretty piece of Dendritic Agate. It has sold, but we do have more of this similar material. It may take awhile to slice and photo more, but if interested, send us a message and we will put it on our list to get to sooner.